Phantom Fireworks is busy “Lighting Up Backyards Across the Country” this time of year, and they want to make sure that they are your one stop to make that happen. Phantom’s business model is very seasonal and, as their sign company of choice, that means we tend to be firing on all cylinders to help make that possible. Phantom’s two largest times of year are the 4th of July and New Year’s Eve as you might imagine. As such, since we handle stores for them nationwide, it gets a little busy around here in the second and fourth quarters of the year. 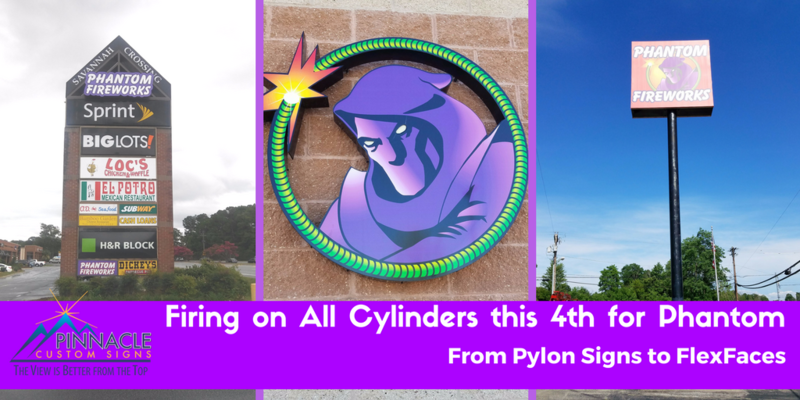 With Phantom’s latest store additions and the upgrade to the Phantom brand, there is lots of activity to help Phantom make this a phenomenal year for firework fun! 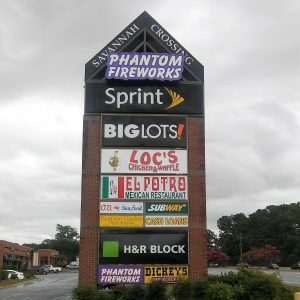 New locations in Decatur and Savannah, Georgia bring Phantom Fireworks presence up to 7 locations throughout the state. Pinnacle is grateful to have handled the new signage needs for both locations as well as their locations in Roswell, Morrow, Duluth, Buford, and Marietta. The installation of signage at the two newest locations included a variety of signage to complete the Phantom branding. In Savannah, we installed a unique channel cloud sign at the top of the merchant monument sign and additional marquee signage at the bottom. The new location in Decatur received traditional channel letters for the front of the building in addition to window graphics to promote the product line for the holiday. In addition, they were looking to update their branding in a few other locations, specifically Roberts, WI and Amelia, OH. Both locations had pylon signs with older branding, and Phantom wanted to update the faces to the newer look before the 4th. 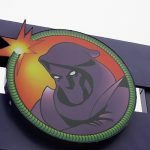 Both locations previously had the standard black old phantom logo that didn’t include the infamous “Phantom” himself. The new Flex Faces on the pylons not only had the new look but also provide a more vivid representation of the brand with the logo contrasting to the red background for a greater color impact for these locations. To meet the deadline, Pinnacle worked with the Phantom team and local contractors in Wisconsin and Ohio to ensure quality and pricing and to have the installations occur early enough to affect their sales rates in June and July. Coordination between all the parties was extremely important in the production of the new flex face signs that we used as well as ensuring the quality and accuracy of the subcontracted installation crews. One of our favorite partners —Royal Printing Solutions out of Colorado — produced the flex face signage due to the large size and quick turnaround needed. Our graphic designer, Joanne, constantly managed each step of the coordination with the companies at each location. The results – the installations occurred before the date Phantom requested, June 16. As one of our national clients, Pinnacle is confident in saying that any Phantom location that you visit this 4th of July is sure to provide you with the “explosive” experience that you should expect from a firework vendor. Each of their locations across the country, as well as their pop up seasonal locations, are a trusted source for finding quality fireworks for you family. To find one of their locations nearest you, visit their store locator online. Regardless of your location from coast to coast, the size of your signage, or even the turnaround time to capture your audience — our team can help. We are experienced in coordinating and capturing exactly the brand look and feel you need to maximize your business’s exposure at just the right time. For more information or a free consultation on how to Pinnacle can help you improve your business, give us a call at (678) 714-8700.